A COMMUNITY initiative in Fishponds that enables people to buy fresh food directly from farmers and producers celebrates its first birthday this month. The Fishponds Food Assembly turns one on July 25 and will look back on an action packed and successful first year. Run by Kola Adetu, Fishponds Food Assembly is a pre-ordered farmers' market providing fresh and organic produce including vegetable boxes, meat, dairy products, bread, wine and food from many Bristol-based food makers. People need to join before they can buy produce but there is no commitment to buy. If you want to purchase items, you place an online order between Wednesday and Sunday evening. Customers can then pop along to Bristol Steiner Academy at the Oldbury Court Road entrance every Tuesday from 5.30-7pm to pick up their order and meet the people who make the food as well as fellow customers. There are 189 local products from 11 producers to choose from, with the average distance the food travels just 16 miles. Because the food is pre-ordered, it means producers aren't having to take away unsold food, which means zero waste. An added bonus is that it encourages like-minded people to meet up when they pick up their weekly shop, adding to the growing sense of community in Fishponds. 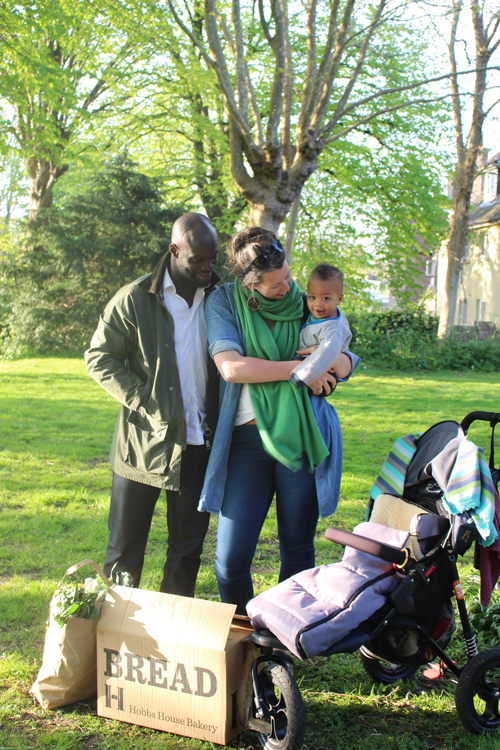 Kola, 37, who lives in Thingwall Park with his partner Rosie and baby son Tayl, set up a Food Assembly in Fishponds after having to travel to St Werburgh's and Gloucester Road to buy the products he wanted. He thought that Fishponds would benefit from a scheme where residents could easily get their hands on local produce. Kola said: "The Fishponds Food Assembly is about supporting local food growers and producers, reassuring them that their journey to Fishponds is worth their while and eliminating food wastage and food miles. "It's also about connecting producers to local people and thereby restoring our primal connection to our food and the land. It's a modern twist on the traditional farmers market. "The first year has been a lot of fun. We have had a lot of support. What keeps me going is that people from Fishponds really love what they get from the Assembly and they show their love and appreciation every week. It's very inspiring that people can come together over their love of good food and this has helped build upon the sense of community." The Food Assembly is a social enterprise and is operated as a franchise with local organisers responsible for sourcing producers, building membership and coordinating a weekly 'market'. It started in France in 2011 and now there are now 700 Food Assemblies across Europe.